Many people think that tinted windows on cars, trucks, and SUVs look cool. But did you know that window tinting also helps you stay cool? We’re not talking about your reputation here. We’re talking about temperature. And temperature regulation is just one of the numerous benefits of having tinted windows, as discussed below. Comfort. As mentioned, tinted windows can help regulate the temperature inside your vehicle. The tinting film helps block out sunrays on hot days, keeping your interior cool, and will radiate and capture heat during the winter months. So, regardless of the season, tinted windows can help you maintain a comfortable atmosphere for you and your passengers. Energy Efficiency. Since tinted windows help you keep your car cool on hot days, and warm on cold days, you won’t need to use your vehicle’s air conditioner or heater as much. In turn, your vehicle will use less energy and endure less overall wear and tear, which will save you money and frustration in the long run. Protection. Tinting your windows can help you protect the things inside your vehicle, from your car’s interior fabric to your own hide. The tinting creates a barrier that blocks out the sun’s harmful UV-A and UV-B rays, which can otherwise fade your interior and contribute to the development of skin cancer. Visibility. Window tinting film decreases the amount of light that comes into your car and will help mute the glare from sunspots and other vehicles, thereby increasing your visibility. Privacy. With tinted windows, it’s harder for others to see inside your vehicle, giving you and your passengers more privacy and making your vehicle a less likely target for break-ins and/or theft. How is Window Tinting Achieved? Put simply, window tinting is achieved by applying a tinting film to your windows. But, of course, the process isn’t as simple as it sounds. Contrary to popular belief, tinting film is not installed on the outside of your windows, but, rather, on the inside. This protects it from everyday damage from nature, road conditions, and debris, as well as vandalism and other unexpected events. The film, itself, appears thin. But it’s actually comprised of two layers. The first layer, which makes up the majority of the film, consists of clear, treated polyester laminate; and the second, thinner layer contains the tinting elements, which may include metal, dye, or ceramic. These layers work together to change the way your automobile glass responds to temperature and light, allowing you to achieve the benefits listed above. 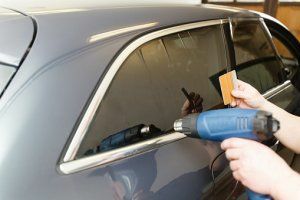 Installing tinting film is both a science and an art—and is something best left to experienced professionals. If you are considering window tinting for your vehicle in or around Pittsburgh, Pennsylvania, Three Rivers Auto Glass is your go-to spot! We’ve been providing top-quality auto glass services in the greater-Pittsburgh area for over 40 years, and we are firmly committed to giving our customers the results they want and need. Call us today for more information or to set up an appointment for service at any one of our six shops. We look forward to helping your car look and stay cool!